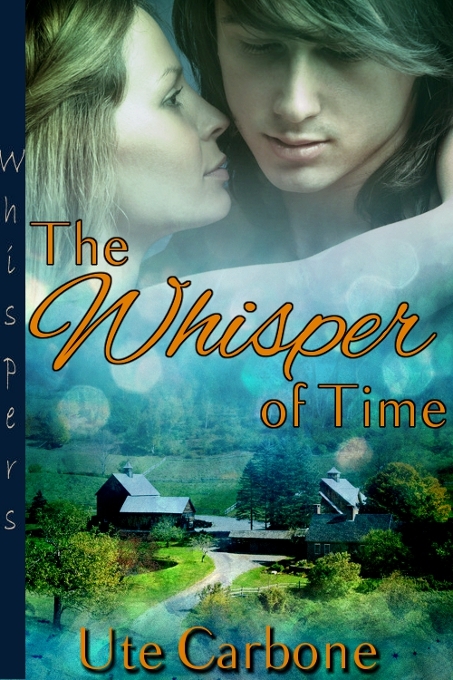 Today’s guest interview is with Gwynn Powell, from the book The Whisper of Time, by Ute Carbone. We’ll start with a bit about the book, look at an excerpt, and jump straight into the interview from there. leaving both her marriage and her old home behind. is tied to Gwynn’s destiny in ways she never expected. Tell us about yourself. What are you like? “rolling with the punches” and turning to do whatever it is life hands me. Do you have a weakness? I sometimes jump into things without thinking things through. I’m pretty sure others would agree. content in my life, I want that for the people I love also. old you were how old would you be? the better part of forever. about you. What do you think the title would be in six words or less? The woman who found timeless love. Oh, I love where I’ve moved to. The farm in Vermont is a dream come true. I wouldn’t want to be anywhere but right here. Hmm, probably “You and I will meet again” by Tom Petty. would people use you to do? together and make something delicious. for pets and farm animals. I loved reading—my favorite books were about animals. and nearly caused an accident. label, what would it say? I love pizza with mushrooms and peppers. I’m always ready for anything! pets and the animals on the farm. You’d never be able to tell, but I’m pretty tough when I need to be. If I had a halo it would be silver and very sparkly. If I could fly I’d do it. I can never leave the farm because my heart (and love) is here. communing with nature. I’m a big fan of chocolate, theater, and really good stories. Thanks for being here today, Gwynn and Ute. Happy to meet you both! Thanks for having us, Kayelle!